Education Minister slams cease-fire with Hamas, says Hamas must return prisoners and disarm in exchange for rehabilitation of Gaza. Education Minister and Security Cabinet Member Naftali Bennett (Jewish Home) criticized the defense policies of Prime Minister Binyamin Netanyahu and Defense Minister Avigdor Liberman after Israel agreed to a ceasefire following the launching of about 200 rockets and mortars at Israel's southern communities. 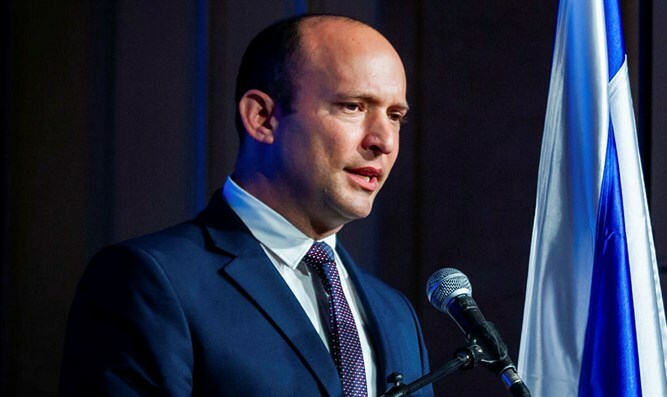 In an interview with Arutz Sheva, Bennett called for Israel to formulate a new equation for dealing with the Hamas terrorist organization: the economic rehabilitation of the Gaza Strip in exchange for the complete demilitarization of the terrorist groups in Gaza and the return of the fallen soldiers and the civilians held by Hamas. "Four months ago, when the confrontations with Hamas began, I warned in advance that the policy of restraint would not bring quiet, but rather create escalation and conflict. The State of Israel must respond strongly to Hamas in order to create an equation according to which all their aggression will be met by our response - this is the only way to deter the next launch," Bennett said. "The public must be told the truth: the perception of restraint and false silence has failed. Restraint encourages the continuation of terror, a false silence is a disregard that leads to an escalation," stressed the chairman of the Jewish home. "Hamas is using our desire for quiet to continue arming, digging up and preparing for the next round. In every round it gets beaten up, then learns and gets ready for the next round - we must not continue this cycle of empowerment. " Bennett reiterated his call for a new equation with Hamas. "Israel must exhaust all the tools it has to restore the martyrs and the citizens. Not many people know that Hadar Goldin was shot and kidnapped during a cease-fire under international auspices. This is a flagrant violation of international humanitarian law. Everyone in the world understands this, except in Israel." "The Goldin family has become like a foreign ministry and intelligence department and has succeeded in convincing the European Union and the United Nations that there is a humanitarian violation here. Therefore, when Hamas seeks humanitarian elements, they must be linked to the return of the fallen soldiers and civilians. "In recent months, I have placed before the prime minister and the ministers in the relevant forums an original plan for dealing with the Gaza Strip and for creating genuine quiet. It has not yet been accepted, but I continue to advance it and strengthen my position - we must dismantle the Strip and return the prisoners and missing persons. "We must not allow the situation to continue in which Hamas dictates the pace of life of the residents of the State of Israel," stressed Minister Bennett.